This clean eating hot chocolate is perfect for a chilly winter evening! The winter months are upon us, it’s chilly, the winds are blowing and the fireplaces are calling our names. This inevitably makes me want hot chocolate. Something I nearly cried over when I thought I had to give it up for the clean eating lifestyle. But then, I got creative. I’ll be darned if I’m going to give up to much of the foods I love. I don’t mind avoiding a few things, but you have to enjoy the life you live, and often, that includes food. I truly believe we were meant to find pure and unadulterated joy in the foods we eat. As human beings, this is our birth right. But the foods we’ve come to define as “good”, are not always good for us. This is a lesson I’ve really been struggling with. So when I can alter a not-so-healthy recipe to one that is a bit more nutritionally sound, I jump all over it! While this is admittedly a once-in-a-while thing, it’s nice to know I have a healthier treat when I want one. Combine all ingredients in a pot and warm over medium to medium high heat. Stir constantly with a whisk. You are sooo right! The hot choc looks amazing. Some of your posts sound awesome, I just may try a few. Say, No Sandwiches? I’m crushed! the hot chocolate looks so good. I love the photo and the tipped-over glass. Beautiful. Thanks! Let me know how you like the hot chocolate! 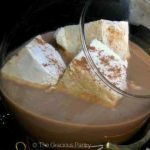 omg i love your site and have for a while now..i love this recipe and the marshmallows…THANK YOU for making clean eating enjoyable and satisfying! Karen – You’re very welcome! Thanks for stopping by! Oh my!!! I just tried this for the first time, it was outstanding!!! Meghann – Wonderful! I love a good cup of hot chocolate on a cold winter evening. Especially when there’s a fireplace involved! I tried this for the first time today when I found myself itching towards the cabinet for the “unclean” hot chocolate that’s still in there because the entire house is not yet converted. 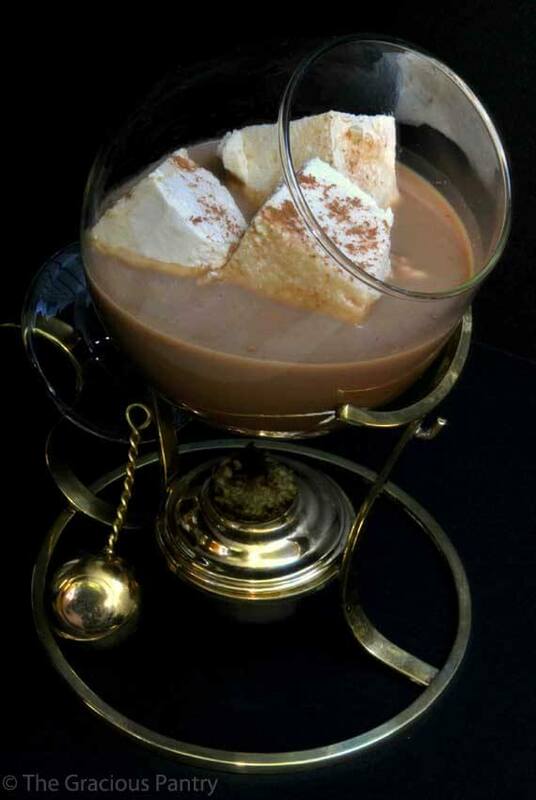 I converted the recipe to one serving so I do not drink all four in one (I have a hard time saying “no” to chocolate) and have not yet tried the marshmallows, but it is definitely growing on me by the sip. Thanks! Marisa – That’s wonderful! I’m glad it’s helping you get through those cravings! Didn’t see the marshmallows in the ingredients list. Are those vegan marshmallows you used? It looks like the Sweet & Sarah vegan marshmallows I found at Whole Foods–can also be bought online through Pangaea Vegan Food Products on Amazon.com. Charlena – No, they are not vegan. They use gelatin. I’m still trying to figure out if gelatin is clean, so I haven’t done any more marshmallow recipes. Stengfive – This is amazing!! I’ve never seen or heard of the stuff! I’ll have to look for it. Thanks so much! Nicole – Haha! Glad you enjoyed it! Carolyin – No, they are not. Amyjo – If you can get it to melt and mix with the milk properly, then it’s worth a shot. Gcgrytdal – Fantastic! As far as I’m concerned, anything is better than the awful packaged stuff. It doesn’t taste real to me. Probably because it isn’t! Yummy! Just came in from the tree lighting at the boardwalk and needed something to warm us up from the inside! MR made us some of your hot cocoa and it was just what we needed! Gelatin is not clean, so no. Sadly, there’s no substitute for gelatin that I know of. I did try a seaweed product that was supposed to be similar, but it failed miserably. That said, the version on my site is a heck of a lot healthier than what you buy in the store. I still make them for Mini Chef on occasion. just made this tonight, best hot chocolate ever! i did use skim milk, it was all i had. i will be making this as the only hot chocolate in my house from now on. Amazing is all I can say!!!! You are the guru of clean eating! Thank you so much for these recipes! Love, love, love this! And your coconut one almost more! I’m totally trying them…but I’m wondering if you can help me. I need to give presents of sorts (im doing nuts for the parents) to some kids of several different ages and I’m on a SUPER tight budget. Since I’m such a proponent for clean eating, I want this to be something that represents me well….but they will still enjoy. I found a cute way to package a hot chocolate mix to look like a reindeer. Only problem, I have scoured the internet and pintrest to try to find a clean(er) version. Think this is possible!? I refuse to use the pre-made stuff. I wonder if I just sub the sugar for coconut palm sugar or sucanat if that would be good enough, but I worry about the taste and I personally don’t have a sweet tooth to test it. Any suggestions!? Thank you as always! I LOVE your blog and re-post your recipes often! LJ – I have a recipe coming up! I’ll also try to do a printable label for it if I can. the chocolate was wonderful but I really love your “pot”… is it available anywhere? Jane – That’s an old brandy glass. It belongs to my mother and has been in her hutch my entire life. I’m not entirely sure where it came from, but I believe it was a wedding gift.